The Xperia X Compact arrives in the same plain white box as other Xperia X-series models. Removing the lid unleashes an explosion of colors on the cardboard, and of course the phone itself. In the box of our review unit there's just a standard-issue AC adapter (5V/1.5A) and a full-size USB to Type-C cable. Box contents vary by market and carrier, so it's worth checking beforehand - your X Compact might come with a fast charger or a headset, maybe. Sony's Compacts have traditionally been chubby fellas, but that's understandable - a smaller body still has to fit all those bits and pieces (at least, that's the layman's explanation). 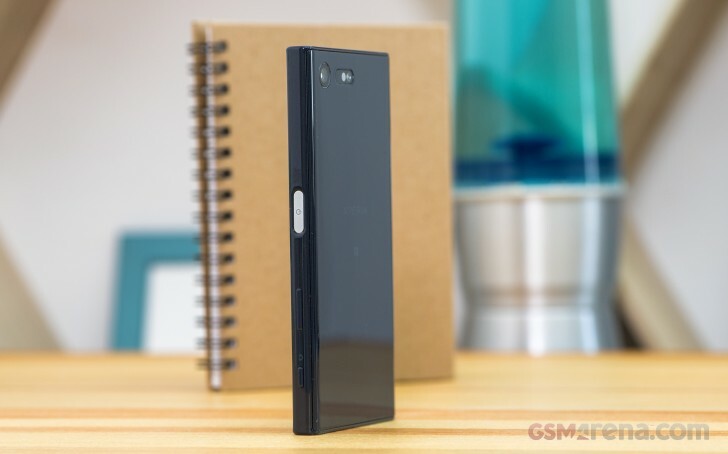 The original Xperia Z1 Compact was 9.5mm, and so is the X Compact. The lineup was, at its thinnest, with the Z3 Compact (8.6mm), and the Z5 Compact was 0.3mm thicker than that. The footprint has stayed virtually the same over the years, but at 129 x 65mm the Xperia X Compact is 2mm taller than the Z5 Compact. At 135g the Xperia X Compact is 3g lighter than the previous generation. The Xperia X Compact follows Sony's new Unified Design. That's one thing it shares with the top-end Xperia XZ and it's what sets it apart from the rest of the Xs. There's no ALKALEIDO here, though - the fancy aluminum alloy is limited to the Xperia XZ. The styling of the X Compact is touted as ceramic-inspired, and we're not quite sure what they mean. Put simply, the X Compact is made of plastic. The choice of material coupled with the dimensions gives it a more youthful look, as opposed to the more authoritative and mature XZ. The polycarbonate is a different kind of fingerprint magnet, but at least there's less phone to wipe clean. The all-plastic back has a few benefits over a metal one. For one, it doesn't require antenna cutouts, so the entire rear is one single piece of polycarbonate, curved towards the sides. It's thus truer to the Loop Surface concept than the metal-clad XZ. The curvy sides feel extra pleasant in hand and also work well to mask its near 1cm of thickness. As a result of the symmetrical design some may experience a minor issue - struggling to tell which side is up in day-to-day usage. The power button does offer some sort of tactile orientation, and the entire issue is perhaps only true for the black/blue color option that we have for review. We call it black/blue because the product color named Universe black that we have here is black only half the time. It could fool you in a dark room, but shine any light on it and deep blue hues are nicely revealed. It's particularly telling when you put the Compact next to black device, like an iPhone 6s or an OnePlus 3. The Xperia X Compact carries no IP rating. 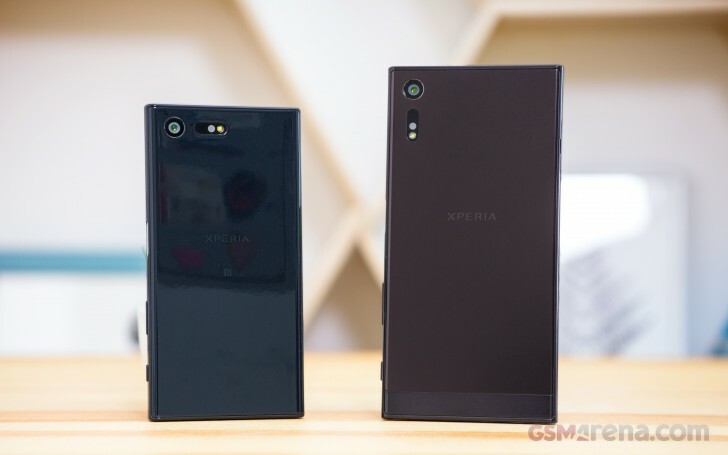 Sony had pioneered the feature, and it was a staple in their flagship design, full-size or compact, but it's now gone on all but the Xperia XZ. There may be no antenna strips, but the camera and its peripherals do need their cutouts. Staying true to the lineup's heritage, the camera module is situated in the top left corner, with the flash to its right. Since the X Compact gets the all-out top-model of a camera Sony has to offer, the flash is joined by the RGBC-IR and laser autofocus sensors, but more on these in the camera chapter of this review. The Xperia X Compact features stereo speakers of the more conventional front-firing type (looking at you, iPhone 7!). The two slits are symmetrically placed on the front on both ends of the display. The top speaker has the front-facing camera on its left and the ambient light/proximity sensor pair on its right. A notification LED light is there too, in the far right corner. The bottom of the phone is home to the USB Type-C port only. Don't let the type of the connector fool you - it conforms only to USB 2.0 spec. The Xperia XZ has a mic pinhole here as well, but the X Compact doesn't, so we figure Sony has found room to fit the mic around the bottom speaker. The top mic is more visible - you can see its opening right next to the 3.5mm jack. There are no surprises in the control layout. The power button that doubles as a fingerprint reader is placed slightly above the midpoint on the right. It's conveniently located for access to the right thumb or the left index or middle finger. The smaller width makes it even more natural to use with the left hand than the Xperia XZ, so lefties shouldn't feel left out. Americans, on the other hand, are left out - Sony won't be offering fingerprint recognition in the US. It shouldn't come as a surprise, though - the Z5 series had the hardware built-in, but not enabled, and it's the same case with the X-series Xperias. The volume rocker is below the power button, and we've been rambling on and on how Sony has placed it too low for comfortable operation. It does the job but requires a significant readjustment of grip especially if you're holding the phone with the right hand. Mind you, we're just thorough - some users wouldn't count that as an issue. Moving on down, we find the physical two-stage shutter button, which comes in handy as a shortcut for launching the camera. If that feature doesn't work for you out of the box, you can enable it in the settings. The card slot is located on the right side of the phone. The combined tray can take a nanoSIM card and a microSD card. Dual-SIM versions of the X Compact aren't available at this time. The shared slot design means that hot-swapping memory cards is out of the question - the phone will restart upon taking out the SIM card.